Power up your learning with this interactive medical assisting training tool! 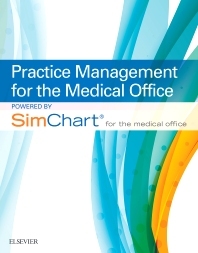 Introducing Practice Management for the Medical Office powered by SimChart for the Medical Office, an intuitive, hands-on learning simulation that provides foundational exercises around the administrative components of the EHR to teach you the steps for claims processing. Realistic activities focus specifically on the practice management functionality within SimChart for the Medical Office, including: scheduling, patient registration, claim entry, payment posting, and report generation. Reports can be coded with ICD-10, ICD-9, or both — and ICD-10 and ICD-9 answers are given for every report — so educators and self-study learners have some flexibility while adjusting to the ICD transition. An educational EHR provides you with a safe, intuitive, and realistic learning environment to develop key documentation and audit skills. Relaunch of Walden Medical as Walden Medical Group — a multi-specialty health care setting — broadens the reach of SimChart for the Medical Office beyond primary care, adding pediatric, cardiac, dental, and surgical cases. Activities focus on the practice management functionality within SimChart for the Medical Office, including: scheduling, patient registration, claim entry, payment posting, and report generation. New print form output for CMS-1500, ADA-J400, and UB-04 so you can output a paper claim form for submission. Reports can be coded with ICD-10, ICD-9, or both, and ICD-10 and ICD-9 answers are provided for every report, giving educators and self-study learners flexibility while adjusting to the ICD transition. Simulation and practice instructions provided with each assignment to support the experience of a real medical office setting with an electronic workflow — and help you complete assignments.